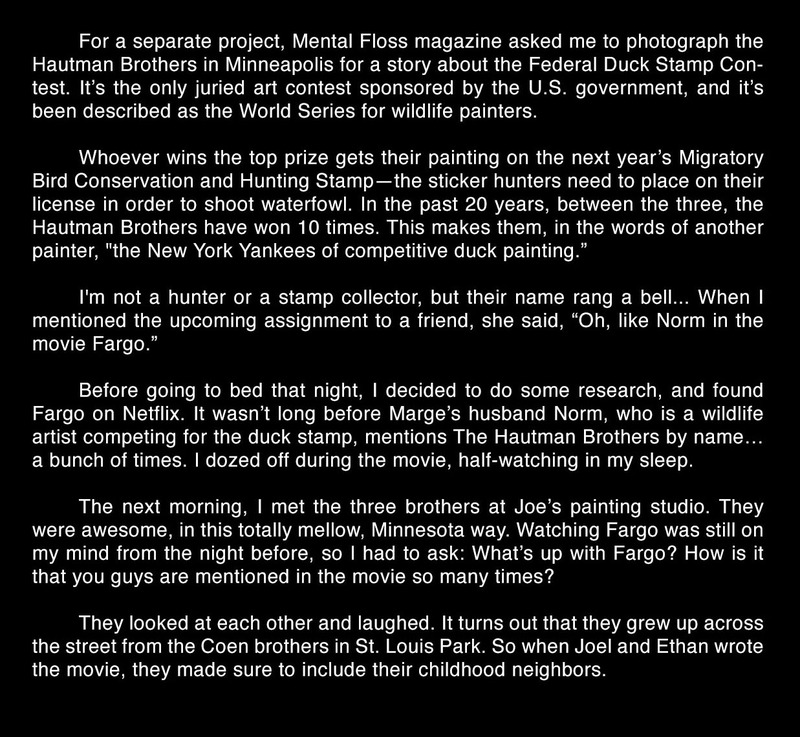 For a separate project, Mental Floss magazine asked me to photograph the Hautman Brothers in Minneapolis for a story about the Federal Duck Stamp Contest. It’s the only juried art contest sponsored by the U.S. government, and it’s been described as the World Series for wildlife painters. Whoever wins the top prize gets their painting on the next year’s Migratory Bird Conservation and Hunting Stamp—the sticker hunters need to place on their license in order to shoot waterfowl. In the past 20 years, between the three, the Hautman Brothers have won 10 times. This makes them, in the words of another painter, "the New York Yankees of competitive duck painting.” I'm not a hunter or a stamp collector, but their name rang a bell... When I mentioned the upcoming assignment to a friend, she said, “Oh, like Norm in the movie Fargo.” Before going to bed that night, I decided to do some research, and found Fargo on Netflix. It wasn’t long before Marge’s husband Norm, who is a wildlife artist competing for the duck stamp, mentions The Hautman Brothers by name… a bunch of times. I dozed off during the movie, half-watching in my sleep. The next morning, I met the three brothers at Joe’s painting studio. They were awesome, in this totally mellow, Minnesota way. Watching Fargo was still on my mind from the night before, so I had to ask: What’s up with Fargo? How is it that you guys are mentioned in the movie so many times? They looked at each other and laughed. It turns out that they grew up across the street from the Coen brothers in St. Louis Park. So when Joel and Ethan wrote the movie, they made sure to include their childhood neighbors.